Badia is a small village located in the centre of the Ladin region which includes Val Badia, Val Gardena, Val di Fassa, Livinallongo (the valleys around the Sella massif) and the valley of Cortina d'Ampezzo. Today, you can experience a vibrant mix of tradition, quality and modernity in Alta Badia and its six villages Corvara, Colfosco, San Cassiano, Badia, La Villa and La Val. The history of these valleys goes back thousands of years and the Ladin culture with its age-old traditions is still very much alive in the typical architecture of the viles (farming villages), the graffiti decorations and the traditional costumes. The Ladin language is still spoken today and taught in schools to remind the younger generations of the origins of their people. The name of these mountains, deriving from the dolomite mineral which was discovered here by the French scientist Déodat de Dolomieu (1.750- 1.801). The Dolomites are composed of calcium and magnesium carbonate. The particular mineralogical composition is the reason for the natural phenomenon called Alpenglow or "Enrosadira" in Ladin language. At sunset the mountains are being illuminated in magnificent shades of red, from pink to orange and carmine. 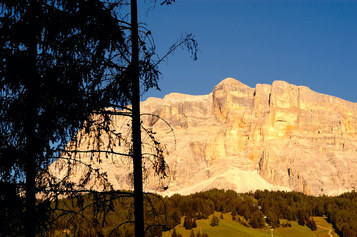 Alta Badia is situated in the middle of two natural parks, which belong to the UNESCO World Heritage. 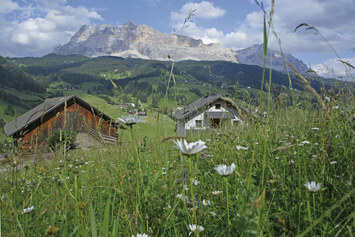 Traditional cuisine in Alta Badia has its roots in the farm cuisine of our ancestors. 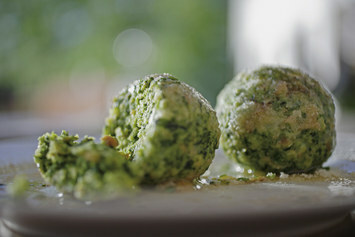 Dishes such as barley soup, Turtres (fried pastries filled with spinach or sauerkraut), Schlutzkrapfen (Ravioli filled with spinach) or Furtaies (a spiral-shaped, fried dessert) remain some the most popular specialities of Ladin cuisine up to today.